La Floilana. Is the field the smallest or the biggest of the farm? 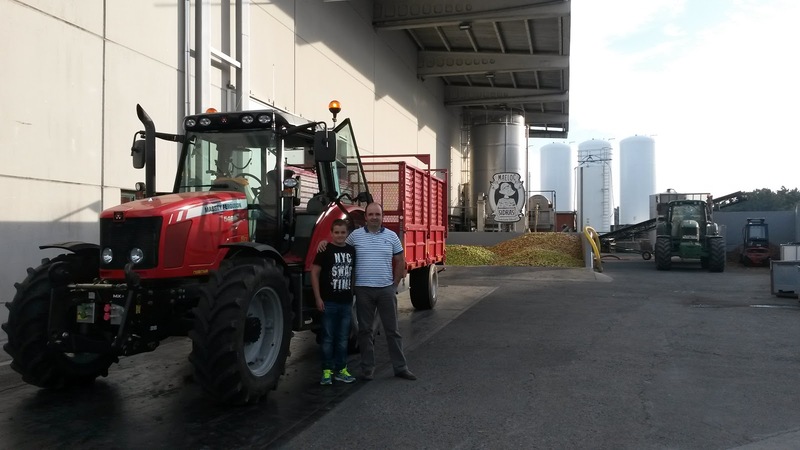 We visited the Massey Ferguson factory (Beauvais - France) in last February and we could meet with Marcos Vázquez, who is a great Galician farmer. He is the owner of Casa de Vázquez Farm and lover of farming machinery. 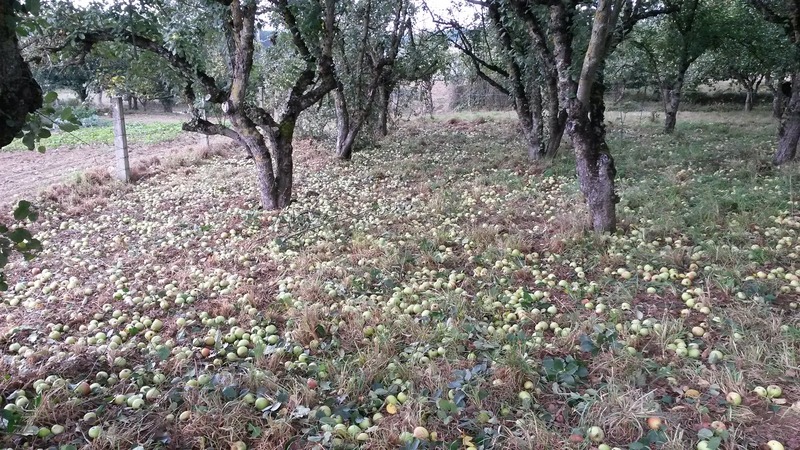 These days, he is harvesting apples to make cider and we asked him for some pictures and information about this interesting work. Besides, he provided us some comments which are attached below. 15 apple trees. Planted perimeter in the field. Production 2017: 1,900 kg of organic apple. 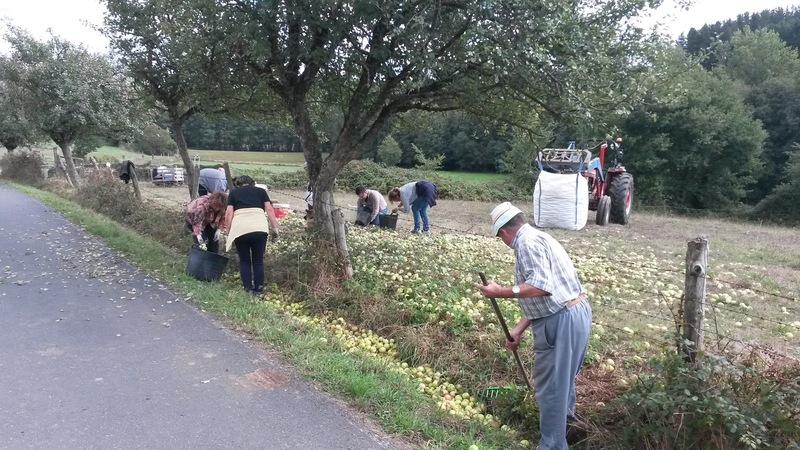 Dedication: one person collects about 460kg of apple per day. Apart from that, the tasks of pruning and grazing take a dedication of 4 days per year. The dilemma begins here and you need to open your mind about "small", "large", "productive", "profitable",... because they are so relative that any evidence as simple as this one of the "Froilana" field can disassemble them. 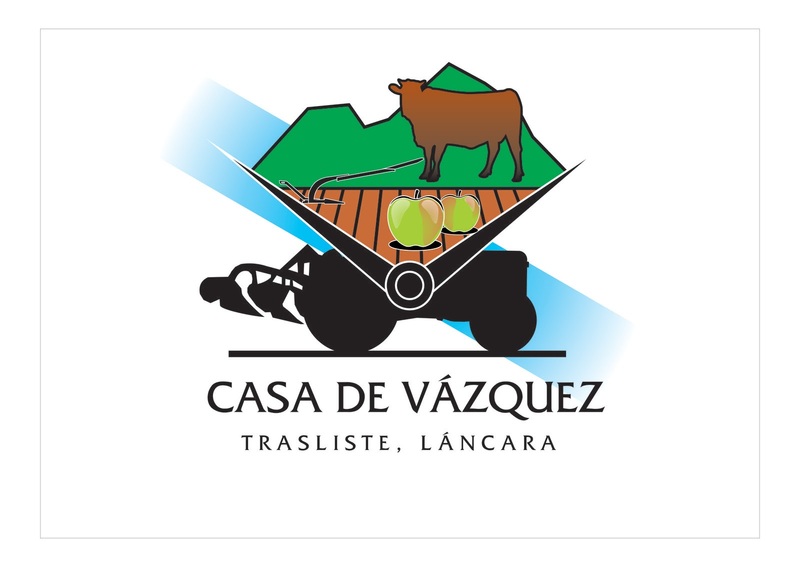 Casa de Vázquez Farm began to produce apples for cider around 20 years ago. The old owner of the farm (Marcos' father) emigrated to Switzerland in 70's where he could see perimeter plantations of fruit trees in a lot of farms. Also, there were some small farms with problems related to the machinery (even the tractor Ebro 44 was made large for 500 s.q.m). From these approaches, he thought apples could be profitable for his farm. His apples are organic since 1999. It is an important goal about quality. This certification is generated by CREAGA (Regulatory council of ecological agriculture of Galicia). Progressively, changes have been introduced steadily: firstly, to increase production, and secondly, to reduce the production gap between campaigns. The plantation in general is considered as something symbiotic with the production of beef (also with ecological certification and appellation of origin with Ternera Gallega Suprema). Cows can fertilize soil and they can feed pasture. The number of trees have been increased on farms that are less than 3,000 s.q.m. 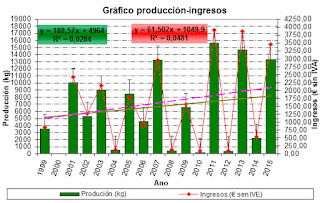 As you can see in his graph, the production is not stable but they are renovating trees for 5 years and the graph of production and profits have a clear growing trend (this last fact thanks to the differentiation with the ecological certification). It was a whooping campaign. The trees planted in the Trasliste field (Láncara Village) produced in excess and they had to carry out preventive shaking to avoid broken branches. Even so, some branches were severely broken. Regarding to the trees planted in the field of Franqueán (village of O Corgo), the frost finished completely with the production. The result was a production of 13,500kg. Nevertheless with the new planting, the expectation for this year was to exceed production in 2011 (15,500kg). As for the price, a significant increase has been achieved, in recognition of the effort and perseverance in this type of work, an increase of 4% compared to the year 2015 (the production was considerable). Their whole production was sold to Customdrinks Company (Chantada). 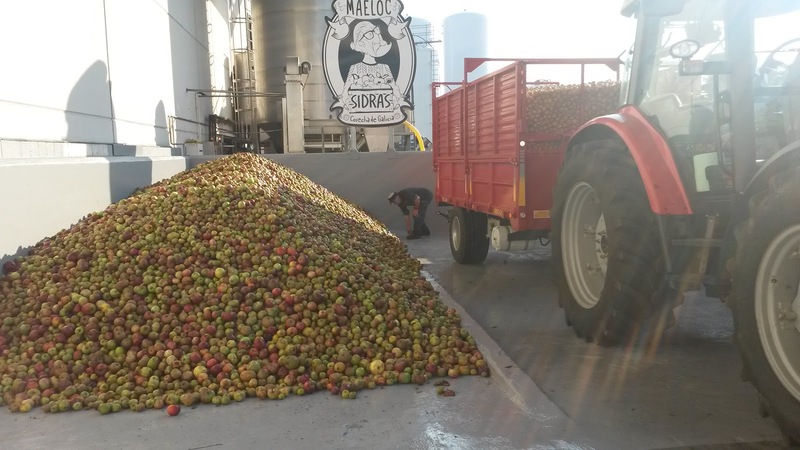 It is a company of Estrella Galicia Group, where Maeloc organic cider is elaborated. 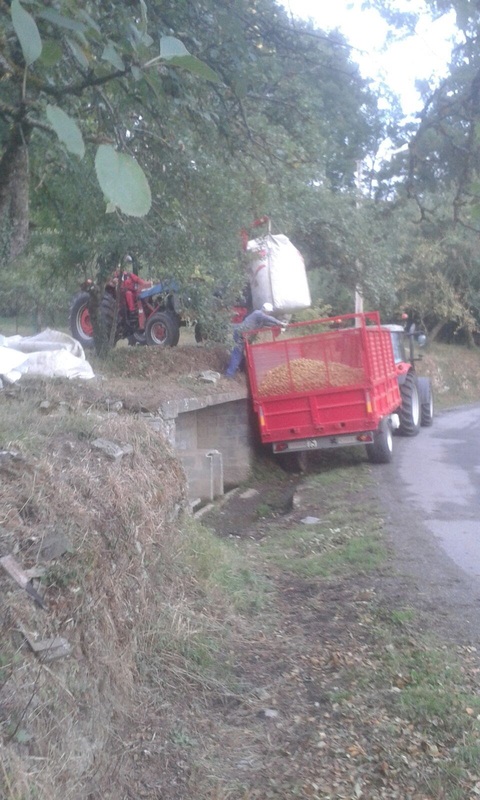 Regarding the improvements in handling that were introduced, the most outstanding was the handling of the apple in big bags, and the load for transport to warehouse with a tool for frontloader of their tractor, that allows them to load directly trucks or trailers that is used for the transport to the factory. In 2015 a new trailer (manufactured by "Blanco y Oro" company) was purchased for carrying out the transportation tasks. 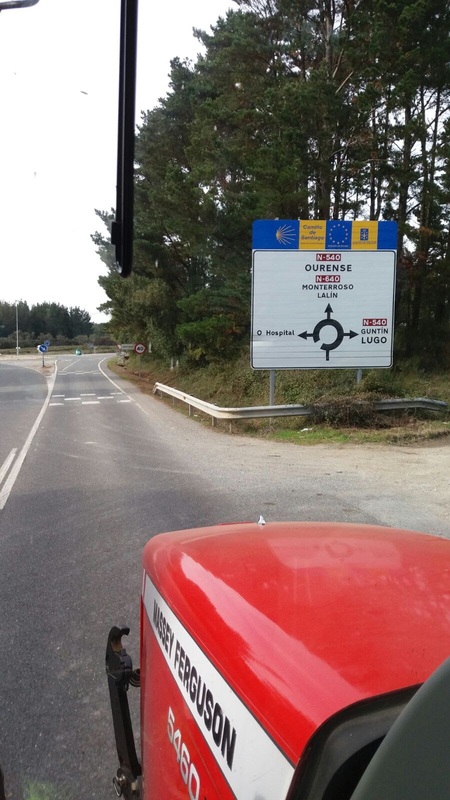 Also they use a Massey Ferguson 5460 Dyna4 Tier III tractor to transport on road, which means a significant saving in money because it consumes only 55 litres of diesel in order to travel the 150 km round trip. They hope to introduce the mechanized shake and the mechanized harvest. Nowadays, harvesting tasks are done manually, with family and salaried labor. Picking up stones: In search of perfection! !